Have you ever smuggled booze into an event? How about into a pub? What about into a wedding? 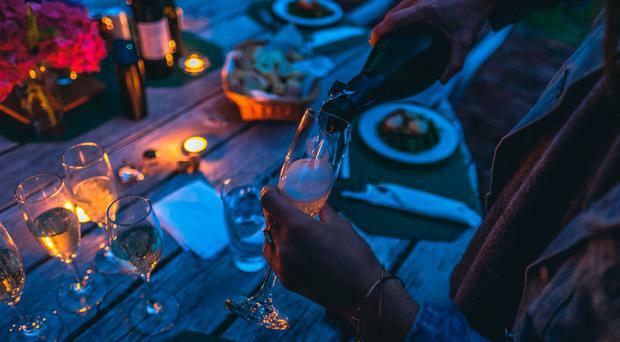 A woman has sparked huge debate about the cost of buying drinks at weddings when she asked users of Mumsnet to come clean about whether they have ever sneakily brought their own booze into a wedding reception to avoid buying drinks at the bar. "I did it," said a user known as TotalPerspectiveVortex, who revealed that not only had the guests brought their own booze into the reception, but so did the bride. "Hotel, middle of nowhere, extortionate bar prices. We were already paying to stay in the hotel, so I took a hip flask with vodka in to the reception. Just bought cokes and topped up. One of the brides knew and even had some herself, thought it was a great idea. I wouldn't do it as a matter of course, but I'd already spent a fortune." Forum users suggested that it was 'pricey bars' and 'boring weddings' that were the main reason for the moral quandary, while others said they were unable to pay for bar drinks having already spent their budget for the wedding on accommodation. "This is fairly standard behaviour amongst people I know!" user FindoGask admitted on the forum. "I can't really see a problem in venues that charge £££ for booze. Most people have already paid for accommodation etc to be there, and the couple would have paid thousands to hire the place too." Another suggested that venues have "a good hard look at their pricing policy" if they were seeing problems with people bringing their own into an event. "I know I'd never book a function at a place with a stupidly pricey bar," the user added. Other forum posters suggested ways to avoid buying drinks at the venue, regaling stories of shared 'car bars' - which saw a group of guests topping up their bar-bought soft drinks with alcohol from the boot of a car - and disguising a wine box in gift wrapping while filling up their glass under the table. "I went to a wedding where a group of us shared a 'car bar'," said CookieWarbler. "Basically a couple of bottles of spirits in the boot of someone's car. We bought soft drinks at the venue and topped up from the car bar. Felt no shame, drink prices were extortionate and at the time I was skint so it made sense to keep the cost down but still go to a dear friend's wedding." "I did this once at a night out," said user Redglitter. "Gift wrapped a wine box in lovely paper with ribbon etc. Cut a hole for where the tap was and stuck a big bow over it. Bow got removed to top up the wine and then replaced again. Worked a treat." While one user said gave a flat out 'no' to whether they were guilty of bringing in outside booze to an event saying it was "disgraceful behaviour", and another commented that they haven't and wouldn't do it as "usually at the functions we go to, the bar is free for guests or at least until a certain time," the majority of users admitted to having done it, and roped their friends and family in too. "My friend and I warned a relative who was traveling up on the morning of the wedding about the prices," said Purplesippycup, "God love her she turned up with several bottles of wine and some vodka, all cleverly wrapped up so the lids were still removable, and put them inside bottle gift bags. She also brought a couple of packs of fruit shoots for the kids. We kept them under the table posing as gifts, and poured under there discreetly, then took them all away with us at the end of the night. We paid for soft drinks/mixers and lagers so we didn't completely dodge paying for drinks. It just allowed us to relax and not worry about how much it was all costing. Felt no shame as we spent a fortune at the hotel anyway, room, food and we did pay for some drinks, and we felt their prices were really unfair considering the drinks were only average supermarket type wines and beers, nothing special. I wouldn't have done it if they were more reasonable." However one poster had a warning for those who partook in the smuggling of booze into a wedding venue - to make sure they smuggle the empty bottles back out again. "If you do, make sure you take your empties with you," they said, "as I've read stories where the bride and groom were charged the equivalent price in 'lost sales' when the venue found the empty bottles under the tables." And when it came to finding ways to get drinks in incognito users had plenty of suggestions, including some rather mucky ones. "Nobody ever searches a changing bag," said user CatThiefKeith "- especially not one with a soiled nappy inside." Comment: Is it hypocritical to get married in a church if all you want is the 'classy church photographs'?